Welcome to the Johnson U.S. Map Project. Alvin J. Johnson was a publisher of maps and atlases from 1854-1887, under the names A.J. Johnson, Johnson and Browning and Johnson and Ward. His Atlases and the maps of the various states in the United States have become collectible and are avidly sought by collectors and historians alike. Many state maps have been removed from Johnson's Family World Atlases and are collected in this form by collectors. The Johnson U.S. Map Project has created a data set of the changes in Johnson's U.S. and state maps which will allow the user of this website to definitively date the publication of any loose map from these atlases. We also present historical essays on the life of Johnson and his atlases and his relationship with other 19th Century American Atlas publishers, J.H. Colton and Augustus Mitchell. Go to the Gallery to view any one of Johnson's Atlas maps of the U.S. along with the data that describes the different versions of that map. Click here to view these maps. 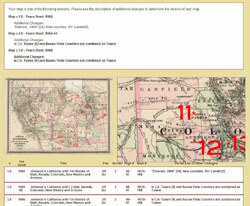 All of the images we use on the U.S. Johnson Map Project have been given to us free of charge from the David Rumsey Historical Map Collection and its website www.davidrumsey.com. If you find this website informative and useful, please consider giving a small donation to support the ongoing hosting and maintenance costs. This project is 503(c)3 non-profit. Donations are fully deductible.